This can be a confusing set of housing numbers and I thought needs some clarification. Doesn’t help any that I misquoted my housing statistics in Joe’s interview. Here’s the correct numbers. New Housing Starts (# new units started) from U S Census. 2012 & 2013 up 28% & 18%. 2014 up 8.4%. 2015 expected up 12.6% and 2016 predicted up 15%. It’s worth noting here that we would need to go back to 1992 to see another year where the number of new units started in the year exceeded 170,000 units. In the 1970s and early 1980s when total housing units started in a year were near two million units, we see growth years of 400,000 to 600,000 new units in a year. After 1984, only three times have we reached new starts over 170,000 unis in a year, 2012 being one of those years. I anticipate we will reach that mark again in 2016. 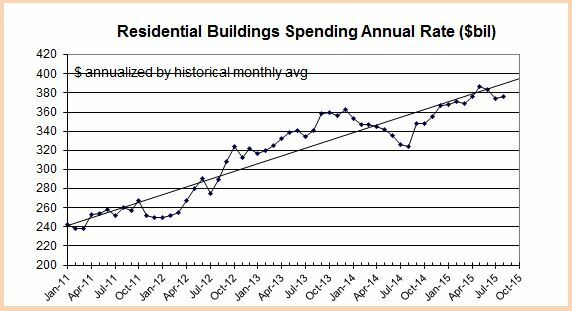 New Residential Construction Starts $ from Dodge Data. 2012 & 2013 up 32% & 27%. 2014 up 10%. 2015 expected up 16% and 2016 predicted up 16%. 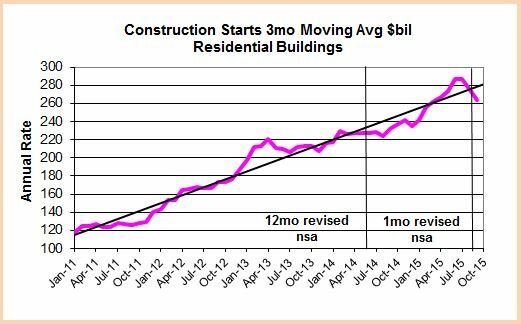 In the following chart of Dodge residential Starts $ we can see the dollar volume of new residential starts stalled from about Q2 2013 through Q4 2013 and then again in early 2014. That slowed spending. 2012 & 2013 up 13% & 19%. 2014 up <1%. 2015 expected up 13% and 2016 predicted up 18%. The 2014 drop in spending is influenced by starts that occurred in the later half of 2013 and through 2014. New units starts monthly were low from May to September 2013 and then again in the 1st quarter of 2014. 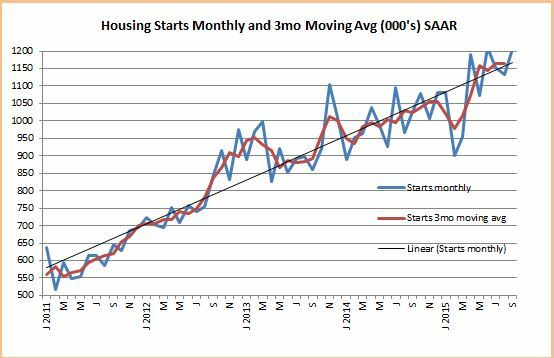 In the Housing Starts chart above, Jan. 2014 starts 3mo move avg are about the same as Jan 2013, showing the slowed growth. The result is spending dropped from Q4 2013 to Q3 2014. Since then new starts have resumed fairly strong growth and spending for 2015 is expected to finish up 16%. See the period from Aug’14 through Apr’15 when spending increase by 20% in 8 months. I think we will continue with 2016 repeating the same growth, although not without some dips in the monthly readings. Speaking to Joe’s point on when does this affect GDP, we can see in these charts that the actual spending gets spread out over time, such that any slow down, or in more recent data any acceleration, gets reflected later in the spending numbers, perhaps over the next 9 to 12 months for residential work. Up to the current quarter where we see a dip in new $ volume of starts, prior to that we recorded 6 consecutive quarters of growth in starts. After a flat year in 2014 we are poised to see residential construction spending contribute 13% growth & represent 36% of total construction spending in 2015. For 2016 I expect similar growth at a very substantial pace up to 18% growth. By edzarenski in Residential on November 6, 2015 .